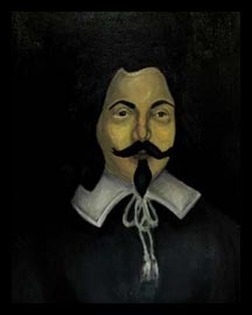 In the Dorothy Purdy Postcard Collection were a series of postcards commemorating the 300th anniversary of the naming of the Saint John River by Samuel de Champlain in 1604. This collection served as the inspiration for the Rothesay Living Museum celebration of the 400th anniversary in 2004. We held an exhibition in the Common Room at Rothesay Town Hall. Several secondary sources of research were used in this interpretative display on a theme of French culture and influence in Rothesay. 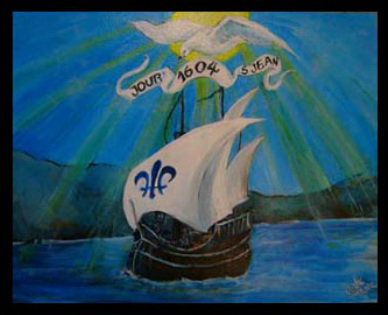 Postcards were used a source for student paintings on the events in Saint John. The book, Fortune and LaTour written by local historian M.A. 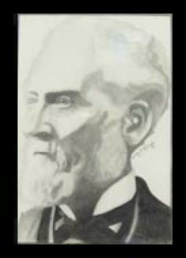 MacDonald, served as the source for an exploration of Acadian culuture. The big surprise was the personal story of Dodie Green, a RLM committee member. Her maiden name was Madill and her relatives were Hugenots. One of her uncles was Joseph Medill [American newspaperman who was a founder of the Republican Party (1854), staunchly supported Abraham Lincoln's presidential campaign and administration, and was editor and publisher of the Chicago Tribune (1874–1899). www.answers.com]. 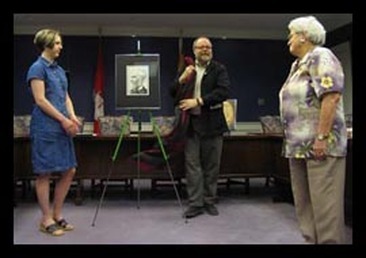 RHS art student Ashley Melvin created the pencil portrait of Joseph Medill and a painting of the MaDill family cottage on Ray's Lake which were given to Mrs. Green who happened to be her neighbour.